So when we last saw our intrepid heroes, Aaron Minier had invited his two good friends to work with him on a comic book, and they told him what he’d done so far was great but also get rid of it and start over. Fortunately, Aaron’s art style had been evolving since he’d first started Black Rose pages back in 2003 – he was already thinking about going back and redrawing some of the old material. So if the art was going to be reworked, why not the story too? Over the next few years, the three of us had lots of brainstorming weekends. Now that we had pressed the reset button, what did we want to bring over from “Ye Olde Black Rose” (as we came to call the prior incarnation) and what new ideas did we have? It’s a much better group dynamic to be co-creators and co-conspirators rather than Boss and Hired Goons. We also drew ideas from another source. During our early college years, Chris had started drafting a fantasy story tentatively titled Wrath. 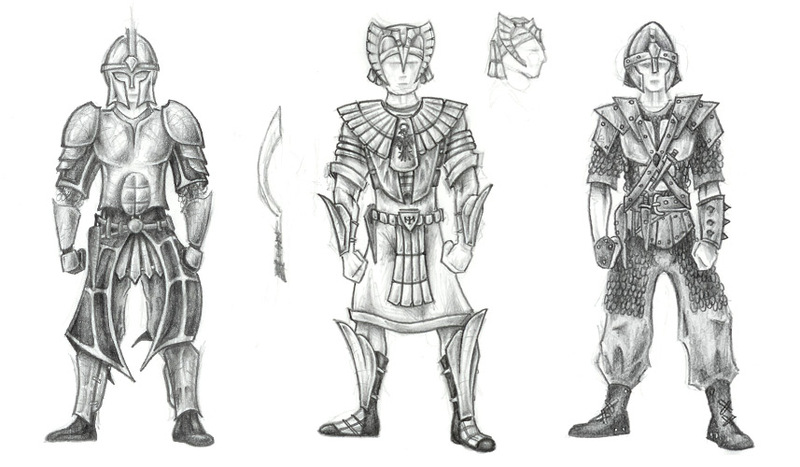 It didn’t get too far in development, but I remember doodling some concept art for it. We were all pretty excited about the new direction for the project. Aaron wanted to start drawing as soon as we finished scripting Issue 1, but Chris and I made him wait until we’d scripted the entire first arc of six issues – we were fairly certain that we’d want to go back and tweak as we went along. Issue 1 was finally released in print in 2010, the culmination of 2-3 years of brainstorming, writing, and drawing. It wasn’t the last time we’d go back and make changes, though, as I’ll talk about next week!